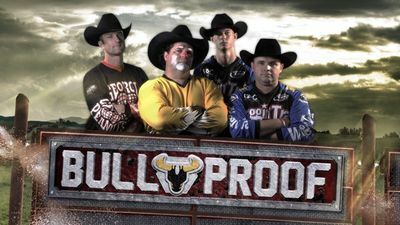 BULLPROOF, the first-of-it's-kind native 3D "sportumentary" program premiered Thursday, May 5 (9PM ET/PT). Featuring some of the world's most extreme man-versus-beast encounters, this one-hour weekly series documents the danger and drama of a group of professional bullfighters as they risk their lives to save the cowboys of the Championship Bull Riding (CBR) circuit. BULLPROOF is produced by Wild Eyes Productions and Digital Revolution Studios. Tim Pastore will serve as Executive Producer on behalf of 3net. The series features professional bullfighters Matt Baldwin, Cody Sosebee, Brandon Loden and Ray Clary as they embark on a new season of the CBR circuit. Each episode highlights the daily risk the riders face and the unimaginable toll their bodies take during the season. The series culminates with the tour finale, as severely injured riders attempt comebacks and the cast battles it out for the ultimate glory that comes with the title "Bullfighter of the Year." 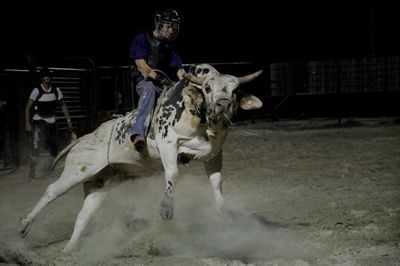 Four Bullfighters put their lives on the line as they embark on a new season of Championship Bull Riding. In Louisiana, bullfighter Matt finds himself helpless beneath a rampaging bull and in South Dakota bullfighter Brandon takes a horn to the jaw. As a badly injured bull rider battles critical wounds in the hospital, the CBR tour rolls on. In North Dakota, young bullfighter Brandon Loden wrestles with his emotions inside the ring and must accept mentoring from his more experienced teammates. Everyone is at risk when a 2000-pound bucking bull escapes into the arena parking lot. At a Fort Stockton, Texas rodeo, rider after rider is badly hurt and one must be carried out of the arena after a young bullfighter makes a critical mistake. Bullfighters Matt and Brandon earn respect from the riders for taking big licks in Lubbock, Texas. Heading into the tour finale, problems leave the bullfighters without two key members and a rider who was almost killed attempts an unbelievable comeback.